Computerised prayers The Singapore Sikh community is using technology, including the Web and PDAs, to keep in touch with the religious side of their roots. A giant screen beaming Computer presentations to a rapt audience may seem run-of-the-mill at a business seminar. But the 500 men, women and children who had gathered in the cavernous hall of the Katong Sikh Temple were not at any seminar. They were there to pray. 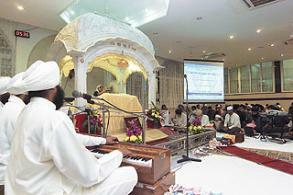 Sikh prayers and hymns or kirtans are written in the ancient script, Gurmukhi, which many members of the community here in Singapore do not understand. Earlier, temple volunteers used to photocopy and distribute scraps of paper containing translations before each prayer meeting, which was cumbersome and uneconomical. So a handful of technology-savvy community members came up with the idea of using a PowerPoint presentation instead. PowerPoint presentations contain not just the English translation, but also transcripts of the verses being sung in Gurmukhi and Roman scripts. Mr Sarjit Singh, 34, a volunteer at the Silat Road Sikh Temple, explained: "The English translations particularly help young community members appreciate the values embedded in our daily prayers better." 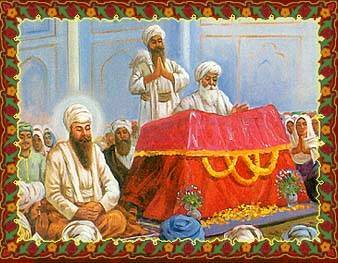 The presentation contains not just the English translation, but also transcripts of the verses being sung in both Gurmukhi and the Roman scripts.